Last night Justin and I had a fantastic dinner at Parkside, on 6th and San Jacinto. I had been intrigued by the menu, which boasted such simple descriptions as “bar steak, fries” and “leg of lamb, charred peppers.” Everything seemed fun and inventive, and the photos of the place made it look very downtown, very city, very cool. 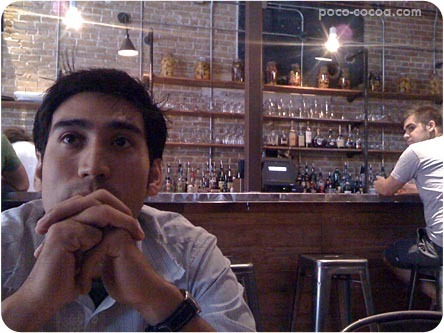 I loved the brick walls and high ceilings, the simple rag napkins and the sleek silverware. I love that the water came to the table in what looked like large medicine bottles, and that the red wine was decanted in what looked like chemistry flasks. I loved that my white wine (A really tasty Rodney Strong Chardonnay, $11) came in a tiny glass tumbler instead of the usual wine glass. 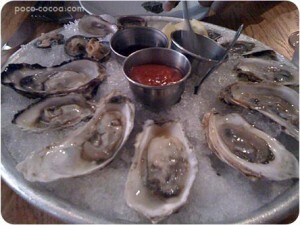 Parkside has a great raw bar, with lots of choices for oysters and other raw ocean goodness. We tried the Small Platter ($38), which came with a huge array of oysters, with horseradish, cocktail sauce, vinegar and lemon to spruce them up. Justin was able to taste a big difference in each of the oysters; I doused mine with lemon and swallowed them down, trying not to think about raw shellfish and vibrio vulnificus. The platter also came with three tiny cups of raw delights: a super-fresh ceviche, barely marinated and studded with red onion; a mix of raw amberjack with grapefruit; and raw fluke with toasted almonds. These three little dishes were so light and flavorful. Next we shared the sweetest, smoothest Corn Chowder ($6), topped with crisp fresh corn kernels and meaty bacon bits. So good. Justin opted for more seafood, choosing the Bass with Watermelon and Serrano Relish ($21). The skin of the fish was crisped perfectly, and the sweetness of the watermelon made a surprising and delicious contrast to the heat of the fresh serranos. 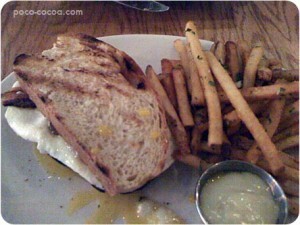 I chose the Fried Egg Sandwich ($9), because really, what is life without runny yolks? It came on toasted white bread and topped with cheese (Swiss, I think) and slices of bacon. The sandwich was served with a side of crisp, flavorful fries and a dish of aioli for dipping. My first bite caused the yolk to run all over my fingers, and though it was super-hot and messy, I was one happy gal. Believe it or not, we saved room for dessert, opting for the Cinnamon-Sugar Dusted Doughnut Holes ($6? ), which came to the table in a tiny brown bag, and were served with three dipping sauces: caramel, brandy cream, and apple butter. 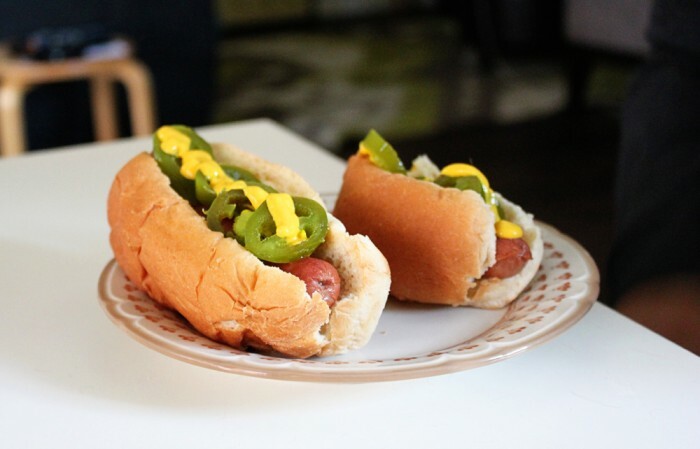 Holy moly, these were good. Also good was the “Snicker Bar” ($6? ), thin chocolate wafers layered with the lightest chocolate and nougat mousse, drizzled with caramel, and served with a bourbon-toffee ice cream. Thank goodness our pal Jason showed up in time to order this, and allowed me to taste a spoonful. It was heaven. The service was hit or miss, but the atmosphere was laid-back and fun, and the food was fabulous. I was tickled watching a young guy at the bar reading a textbook and slurping on oysters. I noticed the hostess was putting away a chalkboard sign advertising Happy Hour, so I think we’ll have to return before 7:00 p.m. someday soon to taste more from the menu. And you should, too.